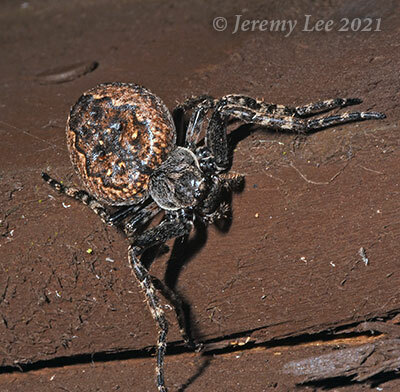 The females of Nuctenea umbratica, or the Walnut Orb Weaver, can grow to 15 mm, males to 11 mm. They have a distinctive flattened body, which enable the species to hide in crevices. The walnut colouration of the abdomen gives the species its common name. The darker central portion with zig-zag edges is also typical of the species and means it can be easily identified from a photograph. It hides away during the day in nooks and crannies or under bark, close to its web and it only emerges to secure any prey that gets trapped in the web. Females of this species can be found all year round, whilst the males are usually seen in summer. After dark, it will emerge to construct a new web each evening and can then be seen sitting at the centre of its web waiting for its next meal. Common and widespread in Britain.